Dhaka, 9 June, Abnews: The expansion works of the eight kilometers long six-lane approach road of Shah Amanat bridge over the river Karnaphuli is progressing fast aiming to open it for traffic before impending Eid-ul Fitr. The bridge connecting road is consist of five kilometers on city side of Baddarhat intersection and three kilometers on the south side of Shah Amanat bridge. The expansion work on south side is nearing completion including final touch of the carpeting. 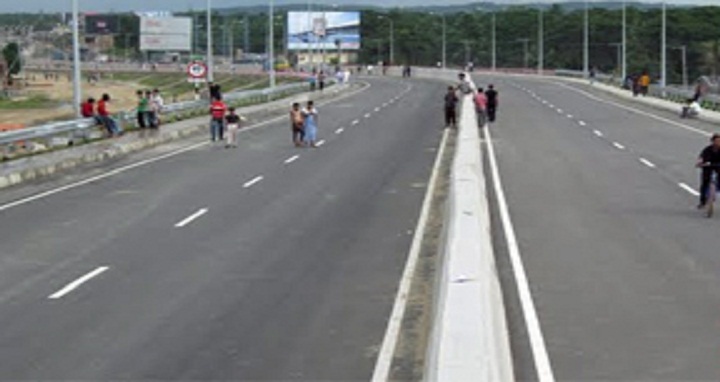 During Eid vacation, the commuters, specially home bound people of south Chattogram, Bandarban and Cox’s Bazar will get advantage of six lane road facilities while city residents on the part of Baddarhat intersection will also avail the easier advantage of communications than the existing one. This correspondent after visiting the Baddarhat intersection part of the approach road, found that the bitumen works is progressing fast where the earth filling and related works are almost completed. The expansion works in city part is undergoing round the clock aimed at relieving the miseries of the home going people of the South Chattogram, Bandarban and Cox’s Bazar district. Project Director (PD) Tofail Mia of roads and highway told BSS that they are trying putting utmost efforts to provide better communication facilities through Shah Amanat bridge connecting road on both sides of the bridge on Eid vacation. The under construction Rahattar pool bridge is expected to open to traffic before Eid festival, he added. PD Tofail said that out of Taka 270 crore estimated cost of the project, Kuwait is providing Taka 107 crores and remaining Taka 163 crore will be provided from government fund.